LRGP suffered a tough Korean Grand Prix in Yeongam with an early exit for Vitaly and a hard-fought battle to gain a couple of places from a lowly starting position for Bruno. No points means the team will be moving on quickly to the first ever Indian GP in two weeks time. Vitaly out-braked himself and made race -ending contact with Michael Schumacher whilst fighting for position with Fernando Alonso. Bruno employed a strategy which attempted to stretch out the maximum from the super soft tyres at the end of the race, but ultimately suffered from rapidly increasing tyre degradation. • Vitaly stopped on lap 14, using a super soft, super soft strategy before his lap 16 exit. 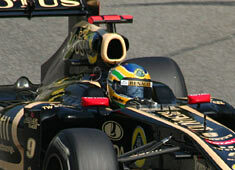 • Bruno stopped on laps 13 and 30, using a soft, soft, super soft strategy. • At the end of the first lap, Vitaly was in eighth position and Bruno 19th. • Vitaly has been penalised five grid positions for the forthcoming Indian Grand Prix for the contact with Michael Schumacher.